NIKON Advanced inverted microscope system offering unprecedented functionality, including built-in Perfect Focus and high-speed motorization. 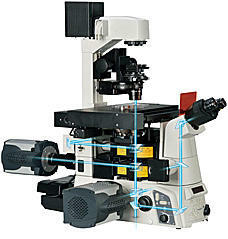 Market leading inverted microscope capable of taking on the most advanced bioscience imaging protocols. Scientists have overcome many live cell imaging challenges using advanced techniques such as TIRF, confocal,FRET, photoactivation and microinjection. At the center of it all is the Eclipse Ti-E inverted microscope, a powerful inverted microscope system that provides instant access to all of these techniques plus revolutionary Nikon CFI60optics. 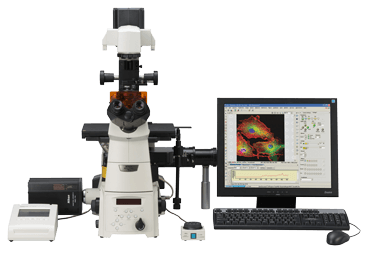 The Eclipse Ti-E inverted microscope offers improved system speed, increased flexibility and efficient multi-mode microscopy as part of a fully-integrated microscope system that is ideal for high-end research and live cell imaging. The Ti-E is equipped with a unique Perfect Focus System (PFS) that automatically corrects focus drift in real time during a prolonged period of time-lapse imaging. Focus drift resulting from a temperature drop when reagents are added is instantaneously corrected and the rapid change of cells can be captured. The incorporation of the PFS in the nosepiece unit saves space and allows two optical component levels to be attached simultaneously utilizing stratum structure. By employing the 870nm wavelength for the coverglass interface detection, near-infrared fluorescence dyes including Cy5.5 can be used. Nikon offers two PFS models, one for UV-visible wavelength imaging and one for multiphoton imaging. 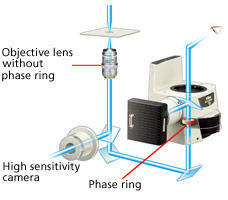 The multiphoton model can correct for focus drift even when imaging with wavelengths ranging from 880-1300 nm. Focus drift can now be corrected in a broader range of Z-axis planes than ever before. 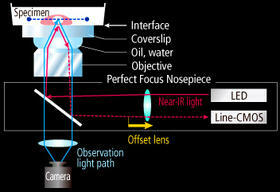 Maintaining focus at greater distances from the objective lens and at greater depths within the specimen is also possible. In addition, PFS’s focus drift correction range has been widened, resulting in more reliable and stable data. In addition to glass bottom dishes, plastic dishes can be used with PFS. * The system is especially suited to high-throughput screening applications that involve multi-well plates. * for use with specific objective lenses. The operational speeds of motorized components such as the nosepiece, fluorescence filters and stage have been greatly enhanced, allowing high-speed screening image capture during multi-dimensional experiments. Faster device movement and image acquisition reduce overall light exposure and subsequent photo-toxicity, leading to more meaningful data. The digital Controller Hub significantly increases motorized accessory speed by reducing communication overhead time between components, boosting total operation speed. The new Ti-LAPP system provides a wide range of illumination modules that can be flexibly combined to create an imaging system tailored for your research. 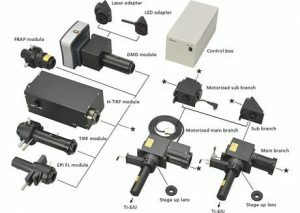 The modularity of the Ti-LAPP system also provides flexibility when the system configuration needs to be changed, an important feature in core imaging facilities and labs that have changing imaging needs. The DMD module enables photoactivation and photoconversion of a user-specified pattern and position(s), whereas the conventional FRAP unit only enables photoactivation of a single, manually-positioned spot. A mouse embryonic fibroblast co-expressing mCherry-tagged lamin A (red) and photo-activatable GFP-tagged lamin A was photo-converted (green) in the lower right region using the DMD module and 405 nm LED light. 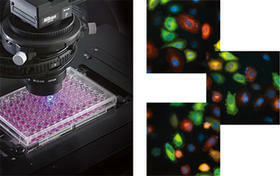 Time-lapse images were captured using the epi-fluorescence illuminator. By photoactivating a sub-population of the lamin proteins, one can observe their dynamics and subunit-exchange behavior. The H-TIRF module automatically adjusts the focus and incident angle of the laser for TIRF observation by monitoring the reflection beam. 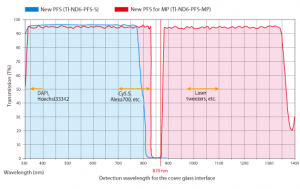 An even field of TIRF illumination is achieved with a gradation neutral density (ND) filter. Three-color TIRF image Using the gradation ND filter, a very even TIRF illumination is achieved. 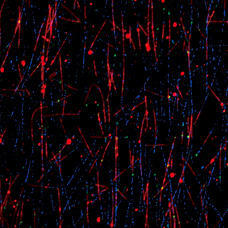 An in vitro preparation of fluorescently-labeled microtubules (tetramethylrhodamine and Alexa 647) and tubulin binding proteins (Alexa 488) was imaged using the H-TIRF illuminator and the gradation ND filter. Incident angles can be automatically adjusted for multiple wavelengths. The Ti-LAPP system’s modularity and flexible configuration capability provide custom imaging solutions for individual research needs. Modules can also be easily exchanged or added to adapt to changing experimental needs, an important feature for labs with evolving research directions and multi-user, core facilities. For example, by adding a second TIRF module to a single-TIRF configuration, users can easily carry out anisotropy experiments and fast, multi-angle TIRF experiments. Adding a photoactivation/conversion module such as the DMD or FRAP module enables tracking of a sub-fraction of a protein population, providing insights into protein behaviors that would otherwise be illusive when imaging the entire population. Use of an optional back port enables multiple wavelengthFRET imaging with multiple cameras. Moreover, by adding an eyepiece tube base unit with a side port, a maximum of five imaging ports* including left, right and bottom ports are available.